There are just three of us here most of the time: Liz, Elena and John. 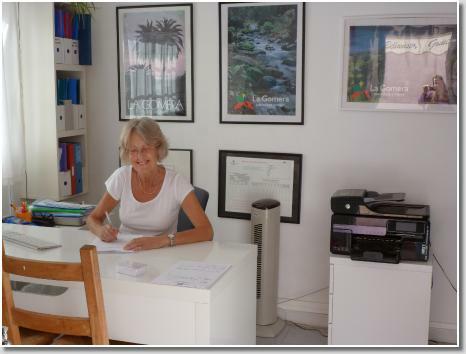 Liz and John (from the UK) fell in love with Gomera on their first visit in 1993 and bought Apartamentos Bellavista Gomera in 2000. English, Spanish and French are spoken and we regret not knowing German! You will meet us all in Reception during your stay. We are happy to help you plan your days' out, book excursions, hire cars, ferry crossings, etc. Reception is open from 09:00 to 13:00 and from 18:00 to 19:00 hrs. Fill in the details of your booking request below with any extra details or requests in the 'Comments' box, then press 'Send' . We wil let you know availability within 24 hours.